The aim of this document is to show how a table can be added to an Article. It is one of four documents with hands-on instructions about editing Articles in a series introducing Joomla! version 1.5. A table is intended for presenting tabular information. Some people use them to help layout pages, especially those with illustrations. There is no icon for adding a table on the simplest editors, so you cannot try this using the simple editor in the sample data in localhost. You could, if you have the experience, add a table there using the source code, HTML. But tables can be tricky. Adding a table may seem cumbersome if you are used to a word processor or spreadsheet. It uses code (HTML) behind the scenes and is less flexible than a word processor. Using the HTML source code If you know enough HTML, you may find it easier to get the layout to your liking using the code. If you are a novice - don't! - or at least not yet. To see the HTML source code - click the Edit code icon . If you are using the simple editor, use the Toggle editor button at the bottom of the Editor screen. . You can toggle from HTML to the normal editing screen by pressing the button again. These change the editor display to allow you to edit the HTML source code. The best tip - keep it simple to start with. Beware - Do not insert a table at the very top line of a page because it upsets the layout and pushes the table off screen to the right of the page! A dialog box appears to enable you to define some of the characteristics of the table. 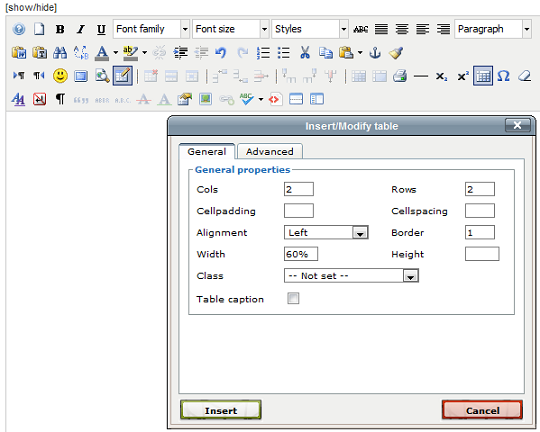 Enter a Width (This will present the table in the editor in a helpful way, so that you can see the cells. If you do not enter a width - the cells are squashed together and are hard to populate. If you have entered a width, the result on the screen is an empty table. Otherwise the rows and columns are squashed together and only expand when you add text or data. Look at the icons along the top of the editor - those that allow you to do things to tables will have become active. A table with two columns and two rows. It also has a border. You can copy tables from spreadsheets and word processors. The layout may not be ideal. You can edit the table using the tools on the tool bar. If you have the experience, you can edit the HTML source code in order to get a better layout. Make changes to such things as border widths. Look under the Advanced Tab. You can change the border and background colours here.